Deal with included 20% OFF Coupon! Happiness and nutrition come in a warm bowl of Quaker Oats, and now with Quaker Instant Oatmeal you can enjoy them no matter how busy your day is. 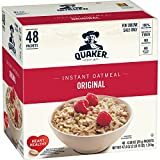 These are the same wholesome oats you’ve come to expect from Quaker in easy to carry single-serving packets that cook in only 90 seconds because they have been finely cut. As the perfect launch pad for flavor, top oats with fruit, nuts or a swirl of honey and start your day off right.